I purchased it with confidence because items are used before. It was saved that delivery was fast. I bought it for protection purpose on the car body side by jackup at the time of tire change. It is useful because it increases the stability when replacing tires. Rubber parts deteriorated & damage due to some installation misalignment occurred, so we replaced. It seems that it fits various floor jack etc. as a general purpose item. Use it when jacking up. 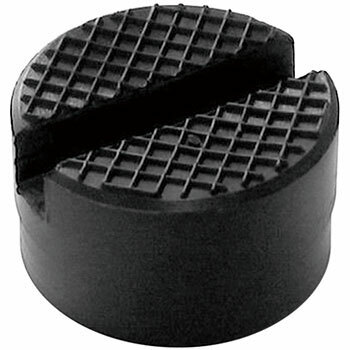 It was a necessity at the time of jacking up, and it was easy to use it properly when hitting the jack point. For the purpose of jacking on the side. I bought it for Meltec's FB-200. It seems to be useful for jacking up from the side because it fits perfectly. For the time of hanging on the side with a floor jack. I used Panta Jack at the time of side hanging but purchased this item because it is easier to use the floor jack. Depending on the type of car, I think there will not be fit, but I do not know if it is not, so I would like to try it with a trial feeling. It seems that you can use it without any problem if it is a light car class. Jack-up work that was unstable with just a 2t jack was able to work with peace of mind. It is a repeater. It is okay not to be aware of the car when jacking up. I thought it was a type that has a detachable pin clearly on the reverse side. I thought that if I had a photograph on the back side, I did not misallocate it.